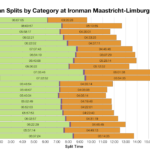 Ironman Maastricht-Limburg is a new addition to the 2015 Ironman Calendar. This year’s race offered 50 Kona slots to a small field of under 900 athletes; it’s not often you’ll see a slot ratio like that. This is a quick look at how the inaugural race shaped up and how it broadly compares to Ironman racing across the rest of Europe. 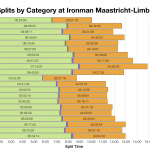 To give some context to the median age group splits from Ironman Maastricht-Limburg I’ve also compiled the median splits from all the 2014 European Ironman races. This is a rough and ready comparison, grouping all the races across Europe in one chart gives a broad spread of results. 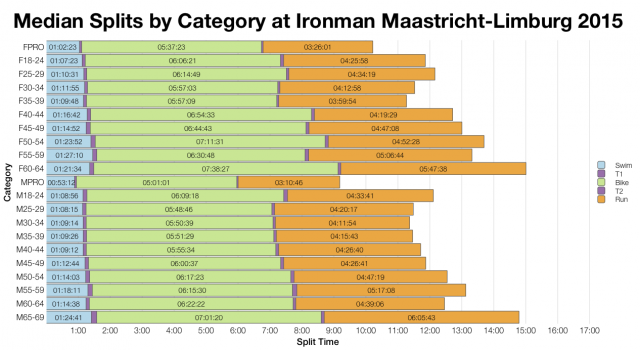 The much smaller field in the Netherlands was less predictable – a few age groups come out faster, a few slower. If we look to the professional field for guidance it would seem that the bike was slower, but the run faster. It’s easier to compare distribution when taking such a high level view. Using key percentile points as a guide there’s not too much to distinguish the results from the Netherlands from what could be called the typical European distributions. Perhaps unsurprisingly the distributions suggest that this new race is much like the others in Europe. I don’t think anything more could be claimed on the basis of a single year of results. With a small field the drop off in time for the top twenty athletes in each age group is steep. Of note no female age group fielded 20 athletes in total. 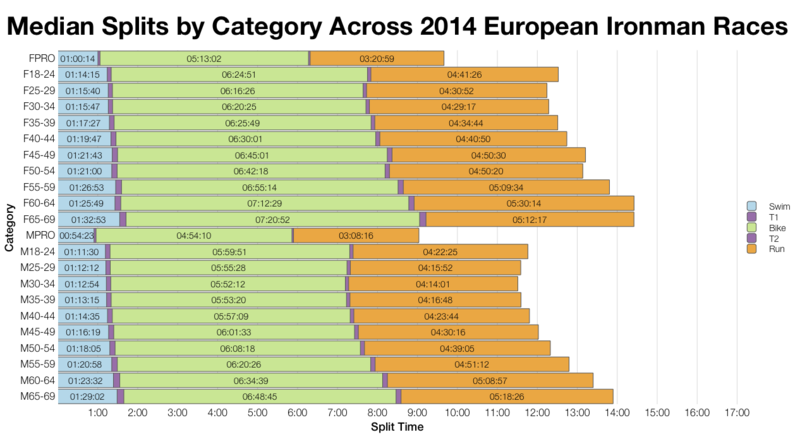 Qualification times are slower than the fastest European races, how much this comes down to the course, the conditions or the size of the field is hard to say. Not that there’s ever an easy qualifier, but I suspect this was a good choice for those who’ve come close at other races. I doubt that will be the case next year. 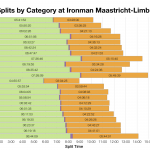 You can access a spreadsheet of the full results and splits from Ironman Maastricht-Limburg 2015 on my Google Drive.